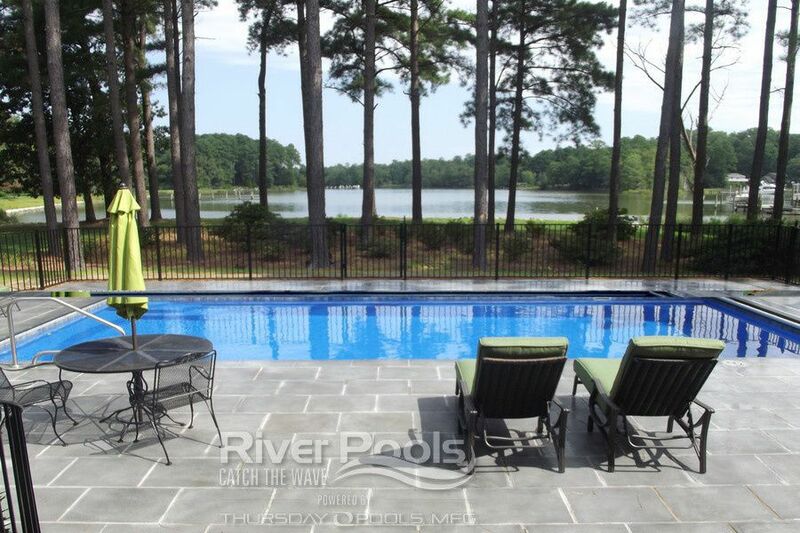 Are you thinking of installing a pool in a yard with trees? We've surveyed hundreds of yards in VA, MD, and WV for inground fiberglass pools over the years, and we've encountered many different tree scenarios. We'd like to share our experience with you today. Here are some common tree questions we are going to answer. How close can I install my pool to an existing tree? Which trees should stay and which should go? Is it okay to build up dirt around the base of a tree? Will tree roots damage my pool or patio in the future? What should I do with the stumps after trees are removed? Can I come back and remove trees after the pool is installed? 1. How close can I install my pool to an existing tree? Trees basically look the same under the ground as they do above ground. So as a general rule of thumb, try to stay outside of the drip line of the tree if possible...but this rule is not set in stone. If space is tight and you really want to save a tree, stay at least fifteen feet from the base (see below for how to protect the tree). If trimming substantial branches is necessary, you will likely want to consult with a local tree expert. 2. Which trees should stay and which should go? It depends on what you're trying to achieve. If you want as little maintenance as possible, the first impulse is to remove as many trees as you can. But keep in mind all trees are different. Pay attention to how much debris, and what type of debris each tree produces. Fruit and nut bearing trees are an obvious no-no. Other types of trees will mostly drop debris after a storm or in the Fall season. If you want more sun or shade, you'll need to pay attention to how the sun tracks across the sky and how each tree impacts the space. Remember that the sun takes an entirely different path in the winter vs. the summer. Direct sunlight on the pool makes a tremendous difference with regards to water temperature. If your pool will not get direct sun for the majority of the day, you may want to consider getting a pool heater. 3. How can I protect my trees during construction? If you want to protect a tree, a best practice is to place a temporary plastic fence around the base of the tree as far out as possible. This will prevent equipment from striking the trunk as well as prevent the ground around the base of the tree from becoming compacted, which would severely hinder the tree's root system. If the soil around the base of a tree does get compacted, an air spade can loosen and aerate the soil without damaging the root system. 4. Is it okay to build up dirt around the base of a tree? Many times in a yard with a slope, the pool is installed and dirt is built up on the downhill side. If this dirt is built up on the base of a tree it will eventually cause "root rot" and kill the tree within three to five years. 5. Will tree roots damage my pool or patio in the future? With regards to the pool, it depends on what type. Fiberglass and concrete pools are not at risk of damage from tree roots. However, vinyl liner pools are. With regards to the patio, it typically takes at least 10 years of growth before a root system can have any impact on a hardscape. As a rule of thumb, try to stay at least six feet away from the trunk with the patio. If you need to encroach more than you'd like, use concrete pavers as opposed to concrete. They can be removed and re-set after the roots are trimmed (although they will likely come back). 6. What should I do with the stumps after trees are removed? If tree stumps are located within the footprint of the pool or patio, they need to be removed. Otherwise, they will eventually decay and leave a tremendous void. A tree with an 18" diameter stump has a root ball half the size of a pick-up truck, so it's important to get it out of there. Just have the tree guy leave three feet of the stump above ground and coordinate with your pool contractor (who will have equipment there anyway) to remove and dispose of the stumps. This is time-consuming and arduous, so it will cost extra, but it needs to be done. If the stumps are located outside of the pool/patio area, the tree guy can grind them down. If you do not designate which stumps to grind, the tree guy is likely to grind them all. This makes the job of pulling the stumps even more difficult for the pool contractor. 7. Can I come back and remove trees after the pool is installed? Yes, you can always come back and remove a tree after the fact, but it will likely be much more expensive as the tree expert will have to work around the pool. Can I learn more about inground pools? You may want to check out: Fiberglass vs Concrete vs Vinyl Liner Pools: An Honest Comparison if you're new to the idea of a fiberglass pool. You can also check out our photo gallery. Did you know we not only install pools in Virginia and Maryland (and across the country through our dealers) but we manufacture fiberglass pools as well? 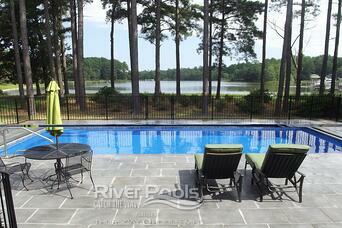 If you are in the market for an inground pool, we'd love to show you our pool designs here. And if you live outside of VA/MD, just ask if we have an authorized dealer near you. Thanks, we hope this has helped and we wish you the best of luck! Next: What is the Best Season for Fiberglass Pool Installation?